This week we’ve rolled out a major update packed full of new features. We’d like to give you a glimpse into each one so that you’ll see how much we care. We’ll help you reveal your potential. 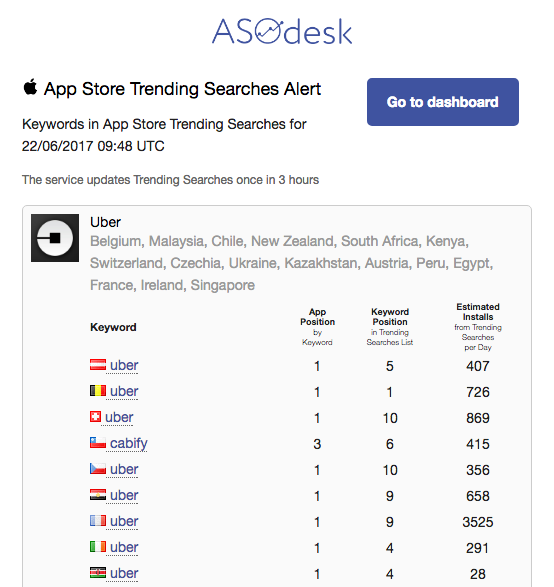 Be aware when keyword or keyphrase for your app appears in the Trending Search section. 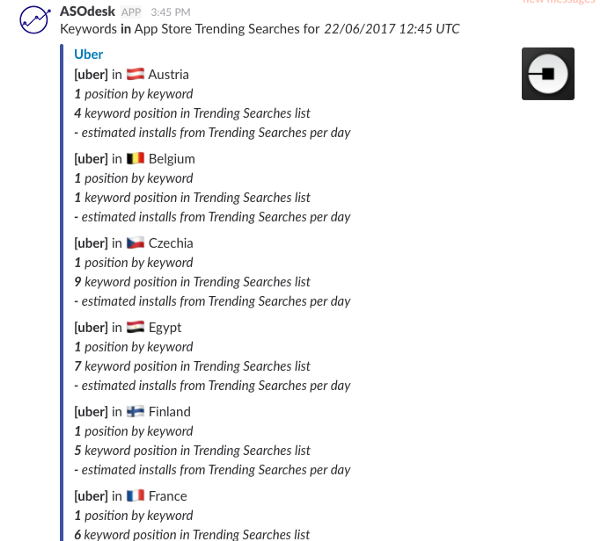 If your app is shown in the top 5 results to this search query, we’ll send you an immediate notification to your email or Slack. We’ll also provide a forecast on the amount of downloads it can bring you. Thus, your analytics will be more transparent and you’ll always know where the growth of your organic downloads comes from. Besides, you can take advantage of the situation and use the trending hype: if you are not in the 1–2 place in the results to the trending query you can instantly boost your app to top and make the most out of it. This option is crucial to those who want to keep abreast of what’s happening within search results, like literally every minute. You can update information on the certain keyword (there is a 🔄 button next to every keyword) or on all keywords at a time (in the “hamburger” menu). The feature is available in Business and Individual plans. Noone of our rivals does show this level of concern for your needs and offer such feature. We hate to make you wait! That’s why we increased the speed of organic report loading by 5 times. It now takes up to 3 seconds to get a report. Sometimes speed matters, and this is just the case. We want to make you feel comfortable. No more confusing popups! Add competitors the same way you are used to with keywords, in the same screen. Less fuss — is an evident plus. 5. We Are Celebrating 1 year Out of Beta! We are now grown-up, mature and our intentions are serious. And we have much to offer! As a proof take this promocode for 40% discount and use it at your pleasure: “HAPPY1YEAR”. It is applicable for all kinds of subscription and is valid till June 27. How to activate promocode?